My amazing readers email me fantastic news stories every day. I tweet them on my Twitter account, but trying to put them in a summarizing blog post sometimes seems daunting. And I’m already posting once a day– I don’t want to go overboard here! “Spent hens” — Although the USDA improved beef standards on July 1, they have yet to act on chicken and fish. Chicken meat that has been rejected by KFC (so called “spent hens”) has been sent to schools for lunches. Prison food versus school food — Do Prisoners Eat Better than School Children? (Tennessee) I’m hearing a lot about this online. I think it’s a very interesting discussion and one that we have had here before. Prisoners rely upon the government for all of their meals and they do deserve to eat ok food while incarcerated. Philosophically I have to wonder how some prisoners eat better than some children. Do kids have to commit a crime to eat better? Finally the post would be swimming in comments and I’d close all new comments. Ack! After I did the post on McDonald’s, I did a lot of thinking about fast food. Also I thought about my own biases and the fact that I might have been a touch judgmental. What remains the same is that I am anti-McDonald’s. The fact is that I never ate McDonald’s as a child, my husband had a terrible experience working for them in college, and I dislike their McFood. Enough said. We go out to dinner about 1-2 times a week. Once if we are home the whole week and then if we travel, which we do a lot over the summer we go out about twice a week. I’m really trying to bring the number down to once per week to save money and because I like to cook. But we usually chose local restaurants, usually ethnic (Asian, Mexican, Italian) and more rarely American diners. Most places charge about $10 per entree, we don’t drink, we like appetizers, but we avoid desserts. We love going out for ice cream at the very local, very adorable 1950’s-style soft serve shop once a week in the summer. That’s how we splurge. And for those of you that do McDonald’s occasionally, what is moderation? Once a month? Twice a month? Once a week? And then in relation to school lunch, is fifteen chicken nugget meals, close to 100 chicken nuggets, in six months moderation? What about seventeen school pizzas? Just so we’re clear: I love walnuts. In the last year we have heard a lot about the National School Breakfast and Lunch Program, especially in relation to childhood obesity. School meals have been criticized as being unhealthy but are also see as an avenue to provide healthy meals to kids and educate them about healthy, local, and fresh foods. However, a program that I have come to know very well is very rarely recognized or discussed. That program is the Summer Food Service Program (SFSP). A troubling but very real fact is that a large swath of the American public has no idea that such a program exists. The program has been funded by the USDA since 1968 and has fed millions of children. However millions more miss the opportunity due to its lack of exposure. On average less than a quarter of the children who are eligible for free/reduced priced school meals participate in the SFSP. What do the other 75%+ children do? What do they eat? Do they eat at all? These are questions that haunt me and that is why, when the time strikes I talk about the program and why we should ALL spread the word about SFSP. The Summer Food Service Program fills a very important hunger gap for children when the school year ends. The catch phrase for the program – “Food that’s In – When School Is Out” typifies the program’s purpose – to ensure that children in need of healthy meals in the summer-time receive them. Having balanced and healthy meals every day is considered important for people of all ages and the SFSP recognizes that the summer can be a time of financial stress for families, and sadly, a time of malnutrition and hunger for kids. What is great about SFSP is that it is free to all children 18 and under and does not require any ID or registration to get a meal. You could be from Texas and go to a site in Massachusetts to receive a lunch, no questions asked. The benefits of the SFSP are bountiful. It relieves families of the financial burden of meals during the summer and children get healthy meals, programming, and fun all summer long! SFSP works like this: School Food Service Programs and Community Organizations apply to be SFSP Sponsors. Sponsors provide administrative support to sites and their responsibilities range from staffing, paper work, tracking reimbursement for the meals, etc. Organizations that have the capability can provide their own meals to sites or hire a vendor. Sponsors and vendors provide administrative support and food to the sites. Sites, like sponsors, need to be non-profits or government agencies. Typically sites are where children receive meals and often times have some sort of programming. A site can be a camp, park, school, food pantry, etc. Sites must be located in a low income census track or within a mile of a public school where 50% of the children receive free/reduced priced meals. The sponsors and sites work together to ensure there are enough meals every day and that there is sufficient promotion so participation is high enough to continue for summers to come. So that is all the technical stuff, but why does it really matter? For many families, putting food on the table with shrinking pay checks and dwindling unemployment benefits has become more difficult. Children need and deserve healthy, consistent summer meals to ensure that they are sharp and energized for the coming fall. Without these meals kids come back to school mal-nourished and at an academic disadvantage before they even step into the classroom. The Summer Food Service Program provides programming, a safe place to go during the day, and of course food and fun! I cannot think of a better and more essential program to support and promote. The SFSP is under-exposed and under-utilized. We can all do our part to spread the word. Find out about the Summer Food Service Program in your community, see if you can become a site or sponsor, and most of all, do not let this important program fall into the shadows. Many children need it; they just do not know it yet. The article/blurb above is great, but completely misses the point that many families don’t have the money to send their children to camp. With families with more than a few kids, multiple camp experiences are not financial realities. Recently a reader (StepShep) alerted me to a recent article in Time magazine The Case Against Summer Vacation. I completely agree that summer vacation is too long for students who have no opportunity to attend a summer camp or have any kind of enriching experience over summer break. Initially the whole idea behind making time in the school calendar for summer vacation was so that children could help with the harvest! Would I work a longer school year? Of course. But I believe that much learning happens outside of the classroom. Although summer vacation is really long, it should be a healthy break from traditional academics and more project-oriented learning. Instead kids are plugging into their televisions for entertainment for endless hours per day. Learning? The only thing they are learning is how to pass Level 10 with the monster you have to kill. 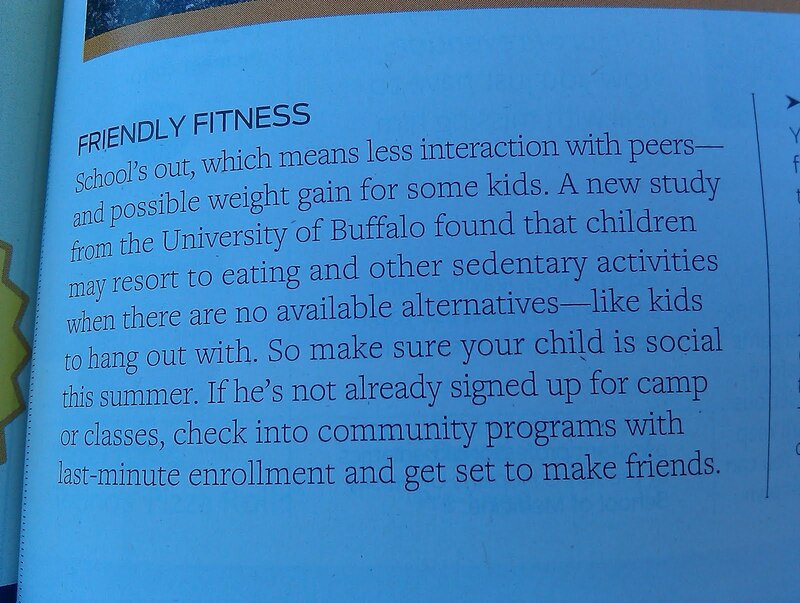 I wish that all kids could go to some kind of camp every summer. Of course with my serious case of “barnheart” (see my post about farms from last week) I wish that more kids from the cities could spend time at a farm camp. The peace that comes when one leaves a crowded area. It cannot be described with words. What about looking up and seeing the stars for once? I love reading magazines. I subscribe to what really is too many for me to manage with what time I have. When I was on maternity leave, I stopped reading magazines for at least six months. I let them stack up while I devoted my whole being to my baby and my job. When I started diving in again, I had a huge pile up of more than 25 separate issues to slowly get through. I put them in a large carboard box and went through them little by little. Enjoyable reading and then off to be recycled. It used to be just Gourmet and Elle but now my monthly collection has ballooned into including Working Mother, Parenting, Cooking Light, Midwest Living, ReadyMade, and Bon Appetit (which was what they sent me when Gourmet magazine was shuttered). I’ve just now signed up for W and Mother Jones (what was I thinking! )… What are your favorite magazines? What do you think of the advertising you see (especially what is geared towards parents)? So I just got myself a TwitPic account and so I’m now tweeting little pictures I’m taking while I read my magazines. I’m going to do blog posts on what I can, but some ads are too short to build a blog post around or the ads are interesting, but don’t relate directly to lunch or school food. So you can get a sneak peek on what might appear as a blog post in the future. I’m going to come right out and say it – cooking with three, four and five year olds in an under-funded NYC public school is an endurance event. It should be its own category at the X Games. It is nothing short of a marathon that ends with a sink full of impossibly dirty dishes, a floor strewn with debris, flecks of dough ground into the radiator vents and small children with pieces of zucchini tangled into their hair. Don’t believe those pictures dotting the internet and cookbooks, of mild-mannered, rule-following children in perfectly white, un-stained chefs hats and aprons, carefully measuring out a cup of flour for their home-made banana nut muffins and never spilling a smidgeon of it onto the perfectly clean counter top. I’m not afraid to tell you, it’s all propaganda. I guess I can say this with some authority. I spent the last year going into my daughter, Lucy’s East Harlem Pre-K every week and cooking with her and her class. Before I came along, the pre-k class had a cooking program, spreading butter on crackers and then, later, spreading cream cheese onto crackers. They had plastic knives and the activity was designed to provide a snack and also encourage small motor skills. It was a good activity, but I was pretty sure it wasn’t actually cooking. I e-mailed the teacher, Lisa. It was a longish e-mail, and I included so many details about myself you’d think I was applying to teach at culinary school. She invited me in as a one-time deal. We went through food issues, religious restrictions, allergies. We struck a deal. We set a date. I was making meatballs. She gave me a 45 minute session with them that included prep and cooking, followed by a tasting. I had at my disposal a hot plate, toaster oven, fridge and a griddle I was donating. The first day cooking with the kids was a blur, a wild ride on a mammoth roller coaster that seemed to end as soon as it started. I remember three things clearly: 1) Three year olds up to their elbows in bowls of raw meat, 2) a boy who would not stop sticking his fingers up his nose, and 3) when I turned my back for two seconds – I mean, literally two seconds – a grated parmesan cheese fight broke out behind me. Before I could stop them, the back third of the classroom was covered in a thick blanket of parmesan. I spent an hour after school picking cheese out of the radiator vents. Children had cheese in their hair. At this point, there was a good chance I was never going to be asked back into the classroom. But Lisa did ask me back (bless her) and the kids and I cooked every week that school was open, September to June. We extended the cooking sessions to two 45 minute sessions a day, prep in the morning and cooking in the afternoon. We began with easy things, getting them used to chopping, cutting, boiling, sautéing. We made pumpkin soup in the Fall and apple fritters. We made Christmas cookie dough and decorated them, and guacamole and home-made tortilla chips. We made Chinese dumplings, the dough and all, and three fillings, tofu, shrimp and pork. Enchiladas, beef flautas, vegetable samosas, and pan-fried pizza with our own dough, almost everything from scratch. Every time we cooked, they learned a new skill and took it with them for the next recipe. They had surprisingly good retention. They started with no cutting in September and then, in October I introduced serrated steak knives and by mid-year, they could finely dice carrots, big chunky root vegetables, onions and garlic without assistance. They made their first dough, pizza and then, every dough after that. By the time, we got to making fresh pasta and home-made bread, it was a cinch for them, something their hands and brains knew how to do automatically. They understood dough. It wasn’t all success, however. We had our dismal failures, lots of them. When we made Fried Chocolate Kumquat Spring Rolls, the room’s freezer failed to freeze the chocolate ganache into a bar that could be rolled and deep fried. The kids ended up rolling melting, thick, oozing kumquat-laced chocolate into spring roll wrappers. They were covered head to toe in chocolate. The kids spent the cooking time licking themselves. We were often too ambitious. The three different kinds of wonton fillings took so long to make they barely had time to sample one kind. There was lemon juice and salt that found their way into cuts and scrapes. There were burnt tortillas and flatbread that was hard on the outside and doughy and undercooked on the inside. There were cooking chores they found tedious and boring, like rolling dough into circles, and others they could have done for hours without stopping, like scooping out curds of ricotta from a pot of hot cream, milk and buttermilk. There was food they loved – latkes, matzoh ball soup – and food they barely ate – vegetable fried rice. It was always a crap shoot and they were maddening in their unpredictability. They could be amazingly productive and focused one day – as they are in these videos of the kids making fettuccine http://theyummymummy.blogspot.com/2010/05/book-and-four-year-olds-making.html – and the next day, they were unable to produce a single noodle, preferring instead to make the noodles, and then mash them up in their little fists, and run the mashed up dough through the machine again, and smash the noodles, and lay back their heads and laugh, as if it were the most comical thing they had ever done. Then, they started throwing it at each other. I spent an hour on my hands and knees scraping pasta dough off the floor with a razor. Once, I made a kid cry after he threw a ball of home-made pasta dough through the air (picture a pint-sized Russian shot-putter) and onto the dirty public school floor. I was pissed and lost it for a second. I barked at him and his face crumpled, tears came. I was horrified. But we talked it out. We came out better on the other end. And I got better at being a teacher. I learned an even deeper level of patience. I got very Zen about “meeting them where they are”. I mentally prepared for the sessions like an athlete before a game. I had little mantras I liked to recite about being patient, no matter what happened, and I had to train myself not to follow behind them making their food look more appetizing, spreading out that big clump of cilantro in the middle of the enchiladas, or making that dumpling look a little less like a testicle. I learned to sense a cheese fight coming on long before it happened. It became very clear to me that leaving an open bag of flour on the table would never end well. Lesson learned. And I got to know the kids. I stopped being “Lucy’s mom” and became “Kim”. We knew each other, our limits, our gifts. We had been through the wars together. We had a real relationship, shorthand, inside jokes, the whole thing, and that felt pretty damn amazing. By May, I knew they could make a lunch for their parents. We set the date for the last week in June. We made everything from scratch and we froze or dried whatever we made ahead of time. The kids made pasta dough from scratch, hand cranked the fettuccine noodles, and hung the noodles to dry on Lisa’s laundry rack. We had to put it up high on the desks to keep the mice from eating it. The following week, we made marinara. A lot of it. The week after that, we made bread dough and I froze it. The day before the lunch, we cooked the dough into flatbreads in a cast iron skillet on the hot plate and the kids made fresh ricotta cheese. The day of the lunch Yahia, a boy who learned to speak English in class, brought to the table at the center of the classroom, a platter of home-made noodles topped with marinara and flecks of basil. Immanuel served the flatbreads, cut into messy triangles, and drizzled with butter, salt, shreds of basil and generous dollops of ricotta cheese. The lunch was supposed to be for the parents, to give them each a little taste of what the kids made this year, a taste of what they could do, an opportunity to see them as extraordinary. But that wasn’t what happened. When the platters went out, the kids ran from every corner to the big table in the center of the room, pulling up chairs and chattering lively. A little girl named Anise grabbed a spoon and fork and started filling her plate with heaps of noodles. They all followed behind her. The kids had completely forgotten about their parents. Most of the parents never even got to taste their noodles. I had packed several boxes of linguine in my bag, as a plan B in case it all went to hell, and the day turned into a spaghetti boil served with the kid’s marinara. Every piece of flatbread and dollop of cheese was devoured. You‘re probably reading this and thinking that I did most of the cooking for the kids, that I let them stir the pot or let them watch me flip the latkes in the frying pan, but I didn’t. Truth is, I’m as blown away as anyone. These kids can’t tie their own shoes, but when given some direction and supplies, they can make dumplings, dough and all, from scratch. Most parents can’t do that. And maybe that’s the lesson here – cooking with small kids isn’t about learning math by measuring cups of flour, or following a picture recipe, or being able to tell an olive from an avocado. It’s about the pure enjoyment of creating something together, the process of being a part of something that is occasionally ugly, filled with disappointments, frayed nerves and monotony, and sometimes outrageously funny, happy, surprising and satisfying. It’s about a kid standing back with his arms folded across his chest and thinking, ” I did that…I did that…I really did that.” And listening to his family and teachers, the people who mean the most in his world, rave about how awesome he is and then, just getting to take that feeling to bed with him at night, letting it melt into his heart a little as he falls asleep. I’m not telling you that you should start packing up your pots and pans and head to your kid’s school to cook with them this September. But if you do, it’ll be worth everything you have to do to make it happen. And when you take your clothes off at night, and you look down and see that you have melted chocolate chips stuck to the inside of your bra, you’ll still think it’s worth it. I promise. I think it was fifth grade. I visited a friend’s house and she had a button-maker. We spent an afternoon coloring and drawing on construction paper to create a couple buttons a piece. I had never encountered a button-making machine before and I vowed to put this spectacular device on my Christmas list (never got it). I wanted to put a motto on one of the buttons and carefully selected blue construction paper and some special stickers (I think one was a little horse and lots of flowers). Other kids may have put the name of their favorite boy band, but I wrote in my best cursive, “I Love Life,” with artful flourishes on the two “L” letters. I keep a few small boxes of childhood mementos squirreled away in a faraway house that basically no one lives in anymore. A few years ago at the request of my mother I went through one box. That’s when I discovered a medium-sized blue button on the bottom. Holding “I Love Life” in my hand was bittersweet: I was a happy and innocent child who was about to be swallowed up by puberty. But for two short years, I must have had a wonderful time. In life things can be good, but I have learned that at any time things can sour. A year later smack dab in middle school we moved across country to another school where I made exactly one friend. Schools out west were strange, foreign places for me. Instead of stately self-contained school buildings, there were no hallways. Classroom doors opened up to the breezes of cold or warm weather. It astonished me that these “schools” qualified for the label: it was more an open air educational mall in cinder block. Bright sun or stiff wind accosted you when you left your classroom door. It wasn’t normal; it was offensive. And it was cold. Whenever I go to supposed “warm winter” places, I forget that their winters feel colder to me. No one dresses appropriately, houses don’t have proper insulation, and as a result fifty or sixty degrees at night feels chillier than it does in the Midwest. I mean sixty degrees is borderline shorts weather where I live now, whereas out west I would need long pajamas! That’s one reason I love the Midwest: I’m always toasty warm in my own home no matter what is happening outside. The teacher I had out there was a pretty, petite woman with jet black hair. It was seventh grade and Ms. Peterson was a screamer. Because of that she will forever be ugly in my mind. She never yelled at me or even really talked to me as I wasn’t a memorable student. I did my homework, got great grades, and wasn’t a behavior issue. But I don’t respond to yelling well and as an educator myself it’s a technique I have rarely employed. It strips dignity from small people and, therefore, doesn’t work. People ask me, “do you remember school lunches you ate?” Not really. But I do remember eating lunch with my one friend. I think we were seated at picnic tables in a large room that was open to the outdoors on all sides. I was so grateful that she was eating with me. It didn’t matter what it was that we ate, it was nice to chat with someone friendly and to be away from my angry little teacher. I know this is off-topic, but I was thinking about my childhood yesterday, I wanted to write a little something and then decided to share what I wrote with you. Just so you know, few coworkers know anything about my life as a child so this really doesn’t give away much. If you want, I can write more or if this is TMI, this is it. Please forgive my grammar and especially my punctuation. One of the next grocery trips I made a point of seeking out this “Fluff.” And I found it. I stared at the jar perplexed. Not what I expected to be used as a sandwich filling. Being the devoted girlfriend I was, I bought a big jar for him and brought it home. 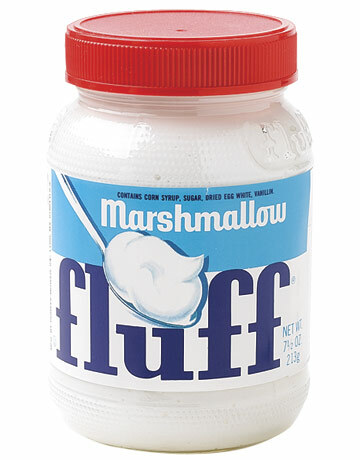 That jar of Fluff sat for a long time. He never opened it. It got pushed to the back of the cabinet and I found it when we were packing up for a move. The contents had separated and it was opened for the first time only so that the contents could be tipped into the garbage and the glass jar recycled. My first and last experience with Fluff. I think of it as a regional food. Do you know what Fluff is? Do you eat it? Any guesses on where my husband grew up?